According to a pair of reports from Accenture, 35% of banks’ market share in North America could be in play by 2020 as traditional branch banking gives way to new digital players. The research also indicates that 15 to 25 percent of today’s roughly 7,000 North American financial institutions could be gone as a result of consolidation before 2020. To combat this shift, Accenture recommends that traditional providers take a radically new approach to distribution, combining a simpler yet more comprehensive branch offering with integrated digital services. New digital technologies, emerging digital competitors and the extremely rapid changes in customer preferences are threatening to dramatically impact those full-service banks that limit themselves to products and services that get distributed primarily through physical branch channels. The outside disruptors tend to be more agile and more innovative, while traditional banks are weighed down by unprofitable branches, legacy back offices and inefficient silos. Business as usual is no longer an option in an industry that could see up to 25 percent of U.S. banks disappear completely. In conducting online interviews with more than 2,000 US retail banking customers of the 15 leading retail banks in the U.S., Accenture found that 71 percent said they were “satisfied” with their bank and 68 percent said they would be “extremely likely” to recommend their primary bank to a friend, family member or colleague. In addition, only 9 percent of those surveyed switched institutions over the past year. This loyalty is fragile, however, since more than a quarter (26 percent) of bank customers who remain with their primary provider do so simply because they consider switching to be a hassle, while about half said they haven’t seen a competing offer that was attractive enough to make them move. The survey also found that two-thirds of bank customers would consider a branch closure as inconvenient and nearly half would switch banks as a result. This not only exposes the tenuous relationship banks have with their customers. It also confirms that the right offering and approach can induce them to switch. “The core challenge for banks: how to build a seamless digital customer experience — and optimize its power with a better and more cost-effective complimentary offering in the branches that customers find so attractive,” concludes Accenture. According to Accenture, many banks have already begun losing their customers to digital disruptors. The survey showed that customers acquired 34 percent of traditional banking services such as CDs, money market accounts, personal and auto loans and even new checking and savings accounts from institutions other than their primary bank. While traditional players have the innate advantage of extensive branch networks that the customer still says they value (nearly 60 percent of new product sales are still closed in branches), these same players should be concerned about the the transition to an online sales environment. 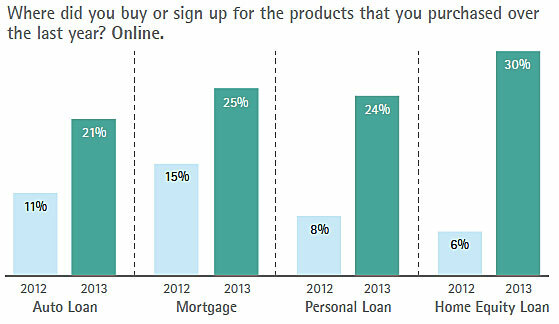 The growth rates in online sales since 2012 are strong in several categories, with online auto loans growing from 11 percent to 21 percent in the past year, online sales of mortgages rising from 15 percent last year to 25 percent in 2013 and sales of personal loans through the online channels jumping from 8 percent to 24 percent in only one year. It is clear that the most fundamental question in the post-financial crisis environment has changed from “how do I find my future customer’ to ‘how do my future customers find me?” Digital shifts inside and outside the industry are rapidly changing the information flows and the way that financial firms and customers interact. It is imperative for banks to become an integral part of customers’ lives with a ubiquitous presence wherever customers are. The branch banking conundrum continues, however, since customers still use branches due to proximity. 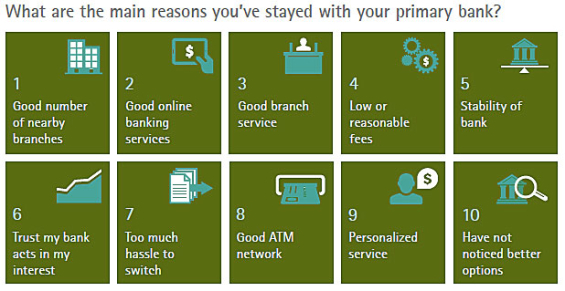 Branches continue to be the number one reason for loyalty and 78 percent believe they will use their branch as often or more often in five years’ time. 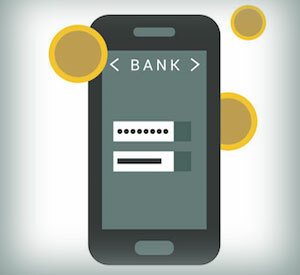 Conversely, with increased use of services like mobile deposit, there has been a 50 percent increase in the number of customers indicating they are using mobile banking in 2013 (32%) than in 2012 (21%). “The internet is now the most frequently accessed distribution channel on a monthly basis . . . well above the branch. And mobile use has soared in the past year, almost overtaking the ATM in its perceived importance to customers,” says the survey. While the migration to online and mobile channels has been somewhat additive as opposed to a complete transition of behavior, online and mobile banking will continue to weaken the branch’s stronghold on the consumer as better applications and more seamless experiences are developed. This migration is imperative due to the high cost to build and maintain a branch and the misalignment between the cost and value of the branch channel. In light of the digital disruption in the marketplace, and as expanded regulation, more onerous capital requirements, economic volatility and consolidation continues, banks need a lower cost operating model that can generate more predictable and sustainable revenues. Branch networks need to be restructured, reducing the number of large footprint offices and increasing the number of ‘light’ branches and kiosks. And while some industry observers believe we are quickly moving to a ‘branchless’ industry, Accenture and others believe the environment will be more of a ‘less-branch’ scenario, at least in the next five to ten years (Chase continues to add branch locations as do other large and mid-sized organizations). But there must be a response to the customer-centric capabilities of the digital players who can leverage big data and analytics to build a better customer experience. With inertia being the main reason current bank customers don’t switch, traditional banks need to quickly mimic the new digital banking leaders. 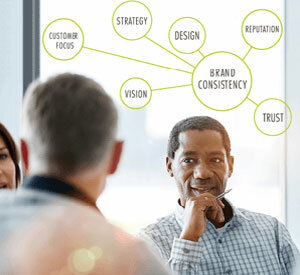 Agility and a stronger innovative culture will be required to compete effectively as our industry invests to upgrade our legacy back offices and deeper customer insights will need to be leveraged to provide real-time solutions to customer needs. Banks and credit unions will also need to eliminate antiquated products, streamline offerings and build new services that leverage the new digital delivery capabilities. By using digital capabilities to track transactional and channel behavior, banks will be able to develop better services and offer new solutions in real-time. This enhances cross-sell opportunities and can increase share of wallet. ‘Light’ branches. Oriented primarily to sales, these offices represent less than a third of the network and are highly automated with a minimal staff and reduced real estate footprint leveraging remote advisory specialists. Kiosks. Representing up to half the total network, these units include feature heavy ATMs with video, and can handle routine transaction activities. Full-service ‘hubs.’ Similar to conventional branches (but fewer in number), these offices offer full sales and transactional support with extended hours and specialized advisors for services like mortgages, investments, business banking, etc. Flagships. A minimal number of strategically located flagships will serve as the center of service-excellence, combining a full range of capabilities including expanded self-service tools. While many banks are already experimenting with more open and flexible branch formats, there doesn’t seem to be a silver bullet yet in response to the digital disruption occurring. A bigger question may be which branches to close or reconfigure, especially with the looming eyes of the Community Investment Act (CRA) regulators looking over the industry’s shoulder. Given the scope of disruption impacting our industry, organizations need to start their transformation today if they want to be relevant in the year 2020 according to the complimentary Accenture report, Banking 2020: As the Storm Abates, North American Banks Must Chart a New Course to Capture Emerging Opportunities. 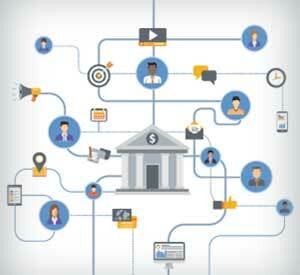 The winning formula may well be to combine the advantages of the traditional bank with the benefits of the digital bank. By reducing the cost structure of branches and optimizing the products and services provided, yesterday’s banks can move into the future leveraging a core strategic asset (a reconfigured branch network) complemented by an enhanced digital experience across all channels. To succeed, traditional banks must become significantly more agile (no more three year planning cycles), embrace an innovative culture, focus on simplification and optimization while delivering an exceptional customer experience… in real-time. This is a very lofty ambition for an industry that historically moves at a snail’s pace, but there really are no options. More importantly, traditional full-service banks must shift their operating philosophy from being a product-oriented organization to being a customer-centric organization with the ability to engage with customers anywhere, anytime they want. The goal is to become a bigger part of our customers’ daily lives and to become integrated with other industries in a seamless manner that reduces friction. Unfortunately, organizations such as PayPal, Square, Google and others are already moving quickly down this path, assuming the role of payments facilitators, supplanting a link to merchants and consumers the banking industry once owned. This article was originally published on November 13, 2013 . All content © 2019 by The Financial Brand and may not be reproduced by any means without permission.